This kohlrabi-broccoli slaw is by far one of my favorite side dishes. In fact I love it so much it’s hard not to eat it all in one serving! Though sadly ;)… I do have to share it with my children as they really enjoy it as well. 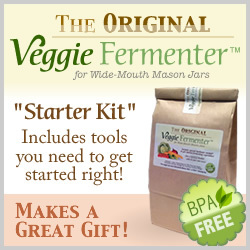 Have you ever tried Kohlrabi before? Kohlrabi, aka “German Turnip”, is a nutrient-rich vegetable in the brassica family (along with kale, cabbage, broccoli, cauliflower, etc.). Kohlrabi can be eaten both raw and cooked (i.e. steamed, stir-fried), just be sure to peel it first as the outer skin layer can be quite tough and fibrous. It tastes similar to cabbage with a broccoli-esque flavor. When purchasing this unique, but forgotten vegetable, try to look for the smaller, more tender ones if possible. 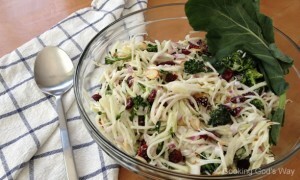 Kissed with toasty almonds and sweet-tart cranberries, this slaw is a tasty side to enjoy anytime of year, but especially great for those Thanksgiving and Christmas get-togethers. Add kohlrabi, broccoli florettes, onion, cranberries, and almonds to a large mixing bowl. Toss all together to combine. Set aside. Meanwhile, in a smaller bowl, whisk together the dressing ingredients. Season to taste with salt and pepper. Pour the dressing over the slaw mixture and toss well until the vegetables are thoroughly coated. Taste and season with more salt and pepper and needed. Slaw will keep for several days in the fridge.